A birthday cake for my office neighbor! I was fairly stressed about all the components to this cake and the execution of the assembly, but I’m happy that it all worked out in the end. Two chocolate genoise cake layers are soaked with a semi-sweet cocoa simple syrup, and topped with bittersweet chocolate-rum ganache and bittersweet chocolate mousse. The surface finish is a chocolate miroir (see description and recipe below), and I used fresh gladiolus flowers for decoration. 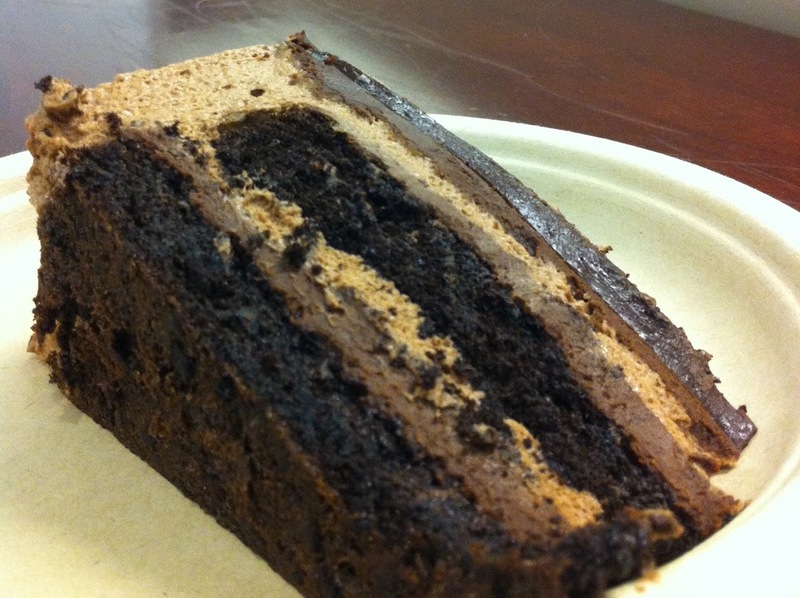 This is a death-by-chocolate sort of cake (which fortunately was the birthday boy’s wish) that is moist and decadent, and oddly both light and dense at the same time. The cake layers are flourless, and bake like a giant souffle (including the tendency to collapse). After realizing that I was not going to perfect the souffle in my first couple attempts, I decided to just make two cakes instead of splitting one cake into two halves. Although the cake is flourless, it is actually an airy genoise that holds up well when brushed with a syrup. The cake is baked in a pan with a removable bottom to allow for easier handling. After baking, the edges of the cake are trimmed to reduce the diameter. 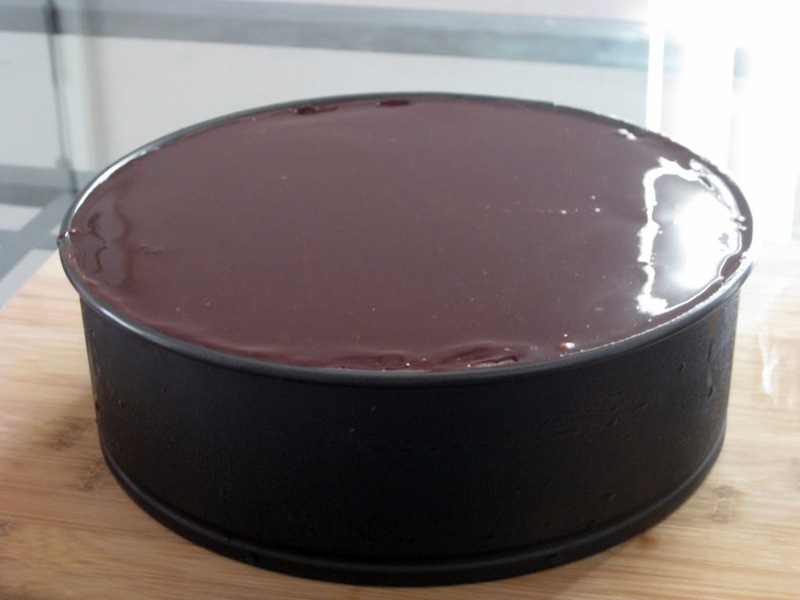 Each cake layer is brushed with the syrup, topped with the ganache, and then covered with mousse, which spills over into the outer rim between the trimmed cake and the cake pan. 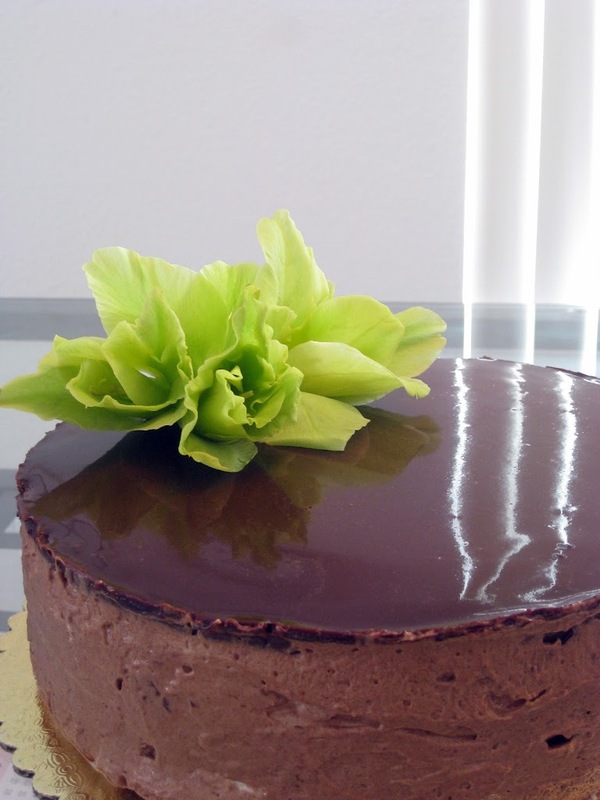 After the cake sets in the freezer, a ganache layer is spread on top, and then a chocolate miroir is poured on to create a glossy, smooth finish. What is chocolate miroir you ask? 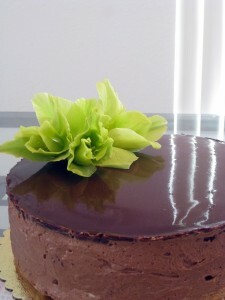 I describe it as a chocolate ganache with gelatin added for shine and texture. Combine the sugar, cocoa powder and heavy cream with 2 tablespoons water in a saucepan over medium-high heat and bring to a boil. Remove pan from heat. While the sugar is cooking, place the gelatin in cool water to soften and bloom. Squeeze out or drain excess water. Add to hot sugar mixture along with the glucose (or light corn syrup) and mix well to combine. Use immediately (pour over cake and spread evenly with a large offset spatula). Dear readers: I no longer possess an SLR camera, so the photography work on this blog will suffer briefly while I use a camera phone and whatever other resources I have within reach during my random baking hours.